Another long thought about project was some rainbarrels. My garage has a downspout that is very conveniently in the middle of my yard and near the garden. 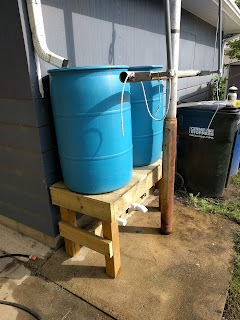 I thought it would be great to put some rain barrels there. 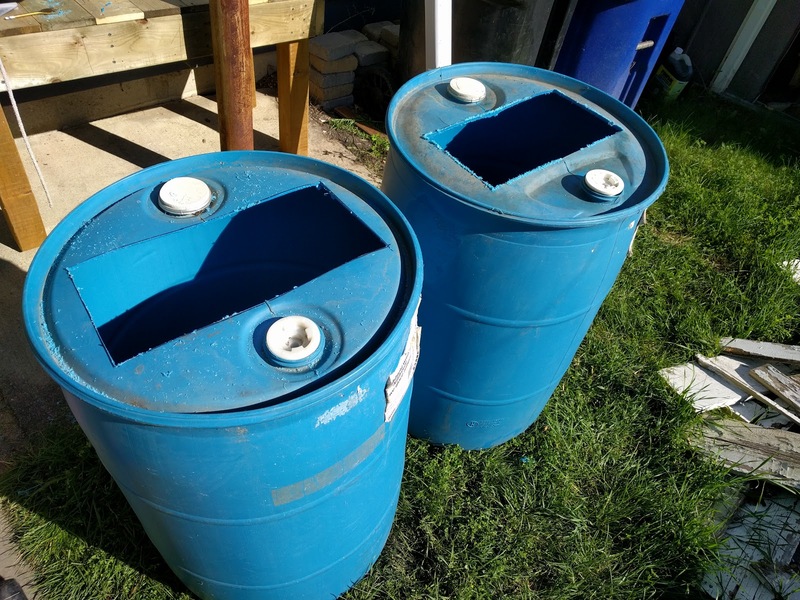 I got a couple blue plastic barrels from a friend and promptly did nothing with them. I thought about using a diverter from my downspout and then figuring out a way to use the water. Maybe a pump? Maybe just dipping a bucket in? I didn't know where to go with it so the barrels sat in my shed for a couple years. My wife came across this article from family handy man and I thought that was perfect. Then I realized what the wood and PVC would cost and I let it sit for another couple years. 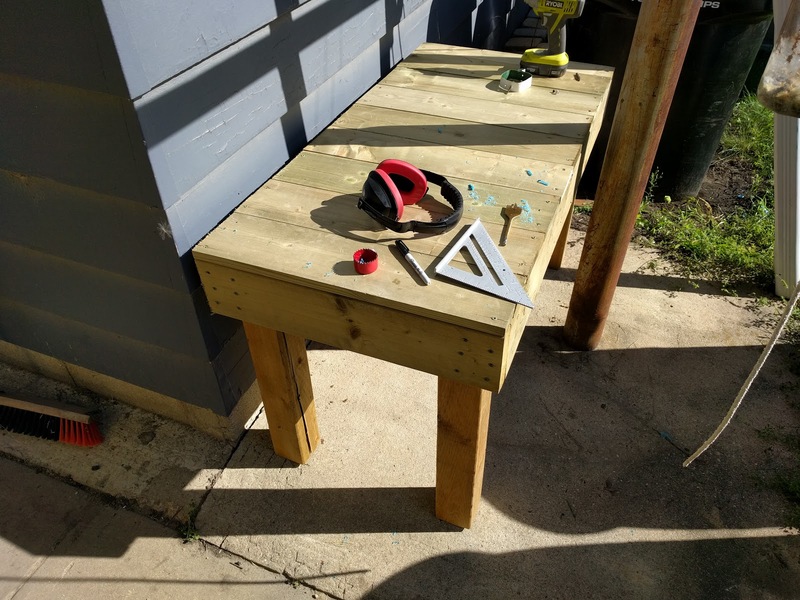 This year I built a fence and my father-in-law built a deck. Now I had some free 4x4's, 2x6's, and fence boards. I say free because I paid for them for the fence, the leftovers were basically garbage. Two 55 gallon drums full of water is heavy (110 Gallons is about 1000lbs) so don't build a shoddy platform. This is all 2x6 construction and the 4x4's are attached on three sides to the frame. The top is fence boards but doesn't really add any structure. 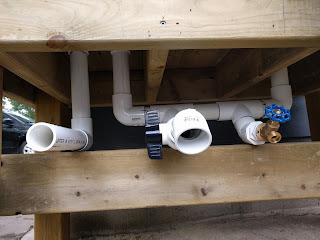 Originally I didn't want to cut the tops open but I needed a way to get the plumbing in so I had to. 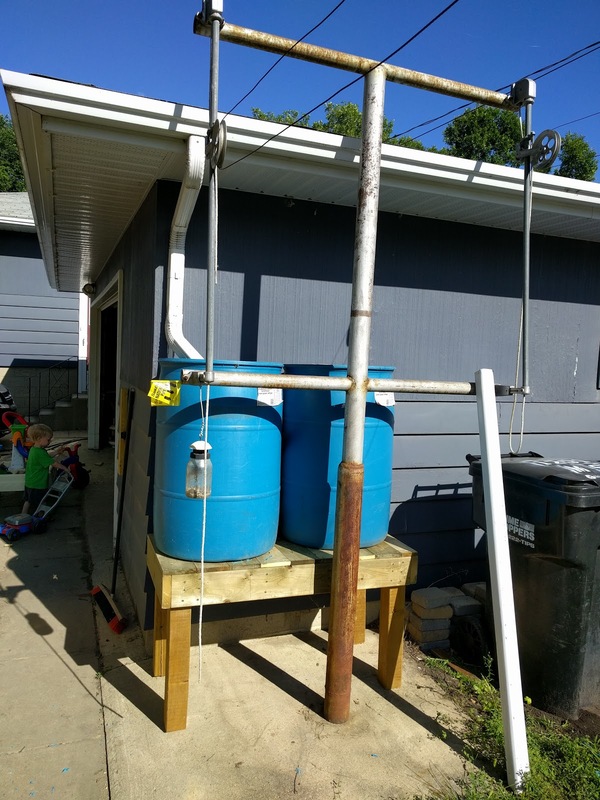 I thought I would run the second downspout over to the second barrel but I found out later that wouldn't be required. Here is the plumbing. The pipe on the left is the overvlow, you can see it in later pictures. 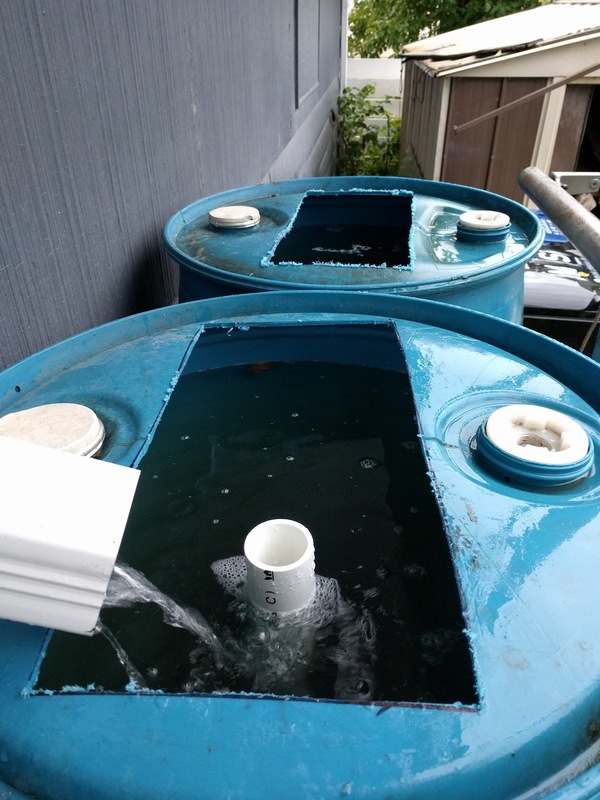 It goes up the inside of the barrel and the water flows into it when the barrel is full. The piping on the right connects the two barrels and also has a 1.5" valve as well as a regular garden hose valve. This is after one night of light rain! I couldn't believe it. Both barrels almost full and only off of one downspout. Guess I don't need to worry about running the other one over here. I had a bit of a leak so I had to drain the barrels. It was pretty exciting and my boys loved it. I've still got to put some screen over the openings but other than that the barrels are done. I'm going to look into watering the garden with it. 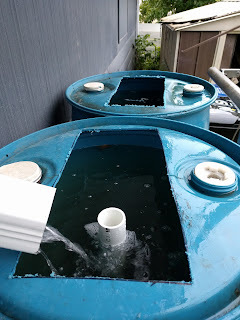 Lee Valley sells kits that work with rain barrels or I might try to build a solar powered pump.